Karen Karnes. Flameware Casserole, 1999/2000. 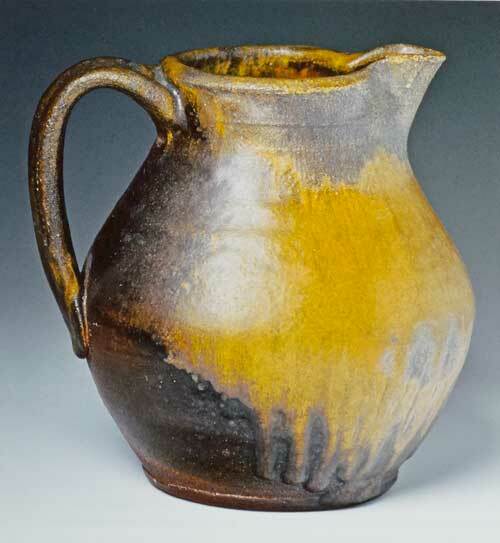 What potter does not have in her consciousness Michael Cardew's jugs, plates, and jars, Bernard Leach's tall vase with fish decorations or plate with a brushed rabbit, and Lucie Rie's long-necked vases with their wide-flaring rims? Don't we all carry, somewhere inside our heads, an image of a Shoji Hamada slab bottle? A Tang Dynasty horse? A face jug from the South? Long before the Internet we read books- sometimes even a potter's own book and discovered her thoughts; we looked at photographs and studied the shapes of various forms - pitchers, teapots, jars; we went to museums and gazed upon pots behind glass; we visited potters in their workshops and, if we were lucky, watched them work. Now, we go online: watching videos of potters busy in their studios and visiting their websites where we play slide shows of their artwork. The catalogue of pottery residing within our heads has increased exponentially, and by extension, has expanded our consciousness of potters and pots profoundly. Online, I watch slipware potters Doug Fitch and Hannah McAndrew work, he in a worn, low building in Devon, England, surrounded by flowers, ducks, and a cat named Bernard underfoot; she in a whitewashed stone building in Scotland, with dairy cows in the adjoining building as neighbors. Vicariously, I experience a part of their lives in clay as I continue to watch videos of them working separately, and more and more often, together in each other's shops. They stack and fire her kiln during a cold and heavy rain. I wait and worry with them for it to be cool enough to unstack. I admire the lovely pots that emerge from the kiln, their robust shapes and glossy glazes in rich tones of honey and molasses. I want one of his large jugs, one of her sliptrailed plates, mugs from each of them. Like many other potters around the world, I followed Euan Craig's blog during those dark and fearful days after Fukushima. I saw the destruction of Mashiko, the pottery village where he lived, and the rubble that was once his kiln. I shared his angst over the decision to move his family and his studio to a new place far from the devastation, and felt joy when the tests came back clean on the firewood he burned in his new kiln, and I knew that he could begin making and selling again. I am in awe of the scarlet blush, the kiss of ash, and the marks left by burnt rush that make his porcelain bowls, teacups, and serving dishes so wonderful. Yes, I think one or two of Euan's bowls would be nice to have. And, a teacup with matching saucer, please. I feel as if I know Hannah, Doug, Euan, and others I follow through the Internet. I have become familiar with their studios and their surroundings. I look forward to seeing their new work, and every now and then, enjoy a glimpse of a pot made earlier in their careers. But, I have never actually met these potters, never touched one of their pieces. How is it that I feel I know each of these potters and their work from around the world when I have never met them nor picked up one of their pieces? What does it mean to know a potter or know a potter's work? Because the processes of pot making are quite sensual - the stickiness of clay, the feel of a centered ball of clay spinning on the wheel, the heat of the kiln - we (makers) take great pleasure in these sensations; we rely on them in both creating our work and in the tactile discovery of fellow potters' work. We run our palms over the belly of a jug, put our lips to the rim of a cup. 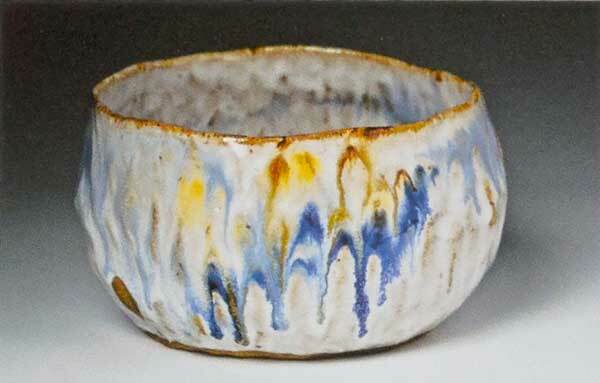 We lift a pot to sense the heft of it, stroke the glaze, and move our fingers up the walls. 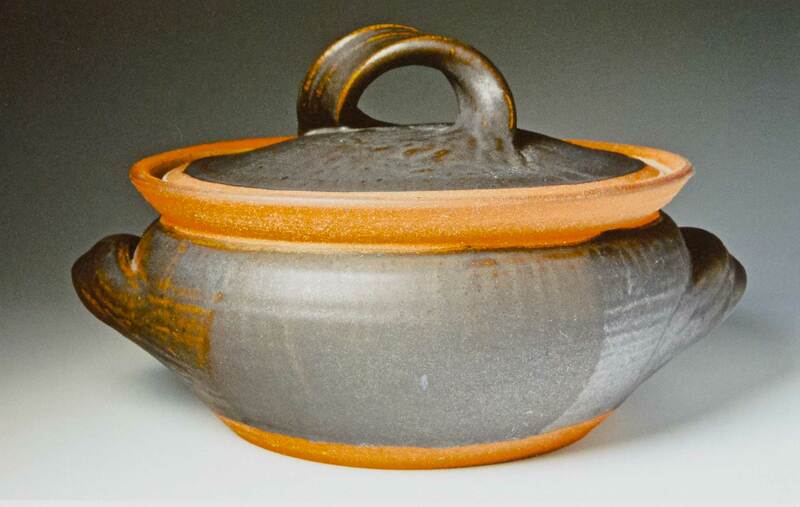 Watch a potter talking about her own work, and you will see him or her mimicking the touching of pots this way. 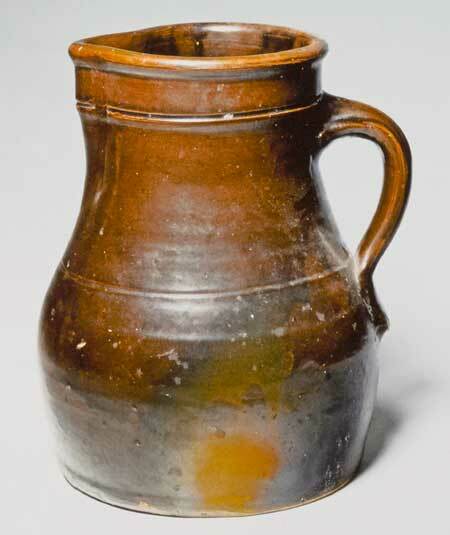 Potters have long held that the enjoyment of a pot is not only the appearance but also the feel. Just looking at someone else's work' doesn't satisfy; we want to get physical. I touch the pots in my home: I run my fingers over the drippy caramel-colored Austrian gin bottle, feel the finger marks on M.C. Richards's generous milky-glazed pinch pot (Image at left), enjoy the fine swirling ridges of Mikhail Zakin's dark green piece impressed with old lace, run my hands up the smallish late-nineteenth-century salt-glazed jug with a whimsical drip decoration and imagine the potter throwing it so many years ago, and hold Louise King's charming little horse in the palm of my hand. I fill a Scott Goldberg bowl with its pleasantly rolled rim and round bottom with mashed potatoes. I roast carrots in an early baking dish by Robbie Lobell. The pots are in my hands when I cook and when I serve, and later when it is time to wash up. This is how all of us best experience ceramics. Despite this, my most frequent encounters with my pottery possessions are visual. I see the pots in my home more than I touch them. From my place at the kitchen table, I see the capacious antique yellow ware bowl I bought years ago; my favorite twelve-pound Guy Wolff flowerpot, a Bartram Tree Pot, which Guy gave me after an exhibit of his work at the University of Connecticut; a large Karen Karnes flameware casserole; a nineteenth-century Albany slip pitcher; the Turkish salt jar I bought in Baltimore; a sturdy Simon Levin pitcher; a lovely medium-size pitcher with a truly perfect shape by Jody Johnstone; a plate rack of my own red and green plates with mugs hanging below. When I admire these, I am merely seeing, yet I know how they feel because I use them. Their tangibility translates to an intimate familiarity. The pots of potters I view online are tangible, too, of course, but I know them only in a virtual way (as I suspect may also be true for the majority of their blog, Facebook, YouTube, and Twitter followers). I have not held these pots in my hands. I've not poured from them. I do not know if the handle fits me. I would prefer to hold a pot in my hand, to turn it over and touch its foot, to feel the thickness of the walls rather than know it only as an image. I would like a Phil Rogers tenmoku-glazed bottle on my shelf. But the truth is, the pots that live on my shelf reside in my head when I leave the room just like all the pots I have never touched. I have a deeper knowledge of them, a more informed appreciation of them because I have held them in my hands, but most of the time, they are only in my head. Pots that we live with are tangible and intangible at once: a part of our consciousness always, a part of our physical life some of the time. 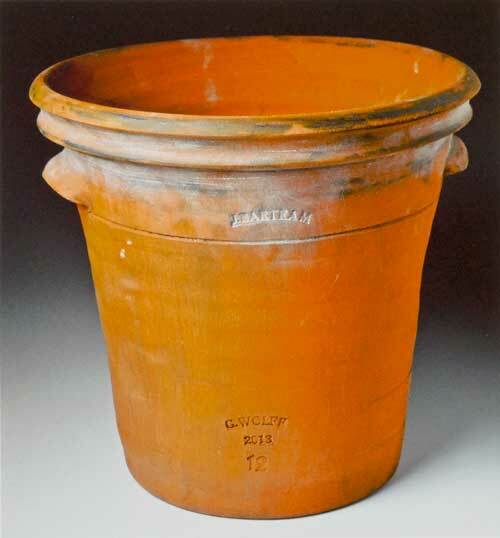 Web Editor's note: See Staubach's article, "Six Pots, or the Meaning of Objects After Death," in Vol. 44, No. 1 on "Sustainability."